The following command will create a NAT rule for all machines connected to the Switch that uses the default gateway to get out. You can use the following PowerShell commandlets to see the configuration after it has been done. Get-VMSwitch will show you the switch with SwitchType NAT. Get-NetNat will show you the NAT configuration bound to the switch. Get-NetNatStaticMapping will show you the publishing rule. 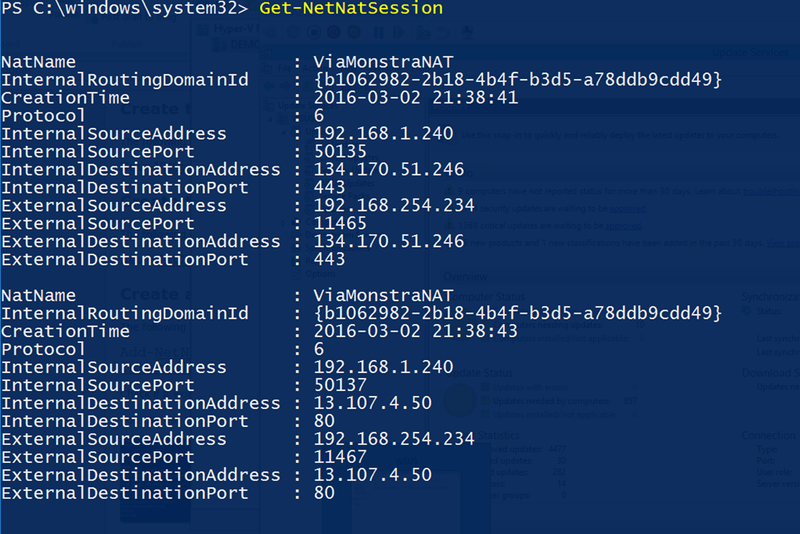 Get-NetNatSession will show you current NAT sessions. I have previously did this on my 1511 build. However, now on the most recent build of Windows 10, the NAT switch isn’t a viable option again. Can you confirm this? I did it on my Windows 10 Build 14291 (Insider Preview) and it works. Darn. Yeah, when I tell it the switch -Switchtype the only options are external, Internal, and private now. This was on my personal laptop that is running Professional not Enterprise so not sure if that can be the case. I will spin up a VM and test later. It works for my work laptop without a problem. Then again, I am still on 1511 right now. Looking forward to seeing you out here in the oven of Phoenix in a few weeks.